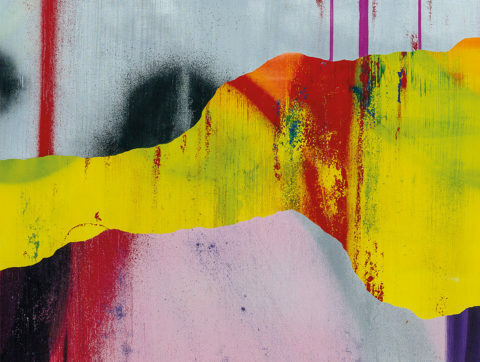 Fabien Castanier Gallery is proud to present a solo exhibition for Prague-based urban contemporary artist Jan Kaláb, Shape & Tone, which will be held in our Wynwood gallery location from April 6 – 27. This will be the artist’s second solo exhibition with the gallery and his first solo outing in Miami. 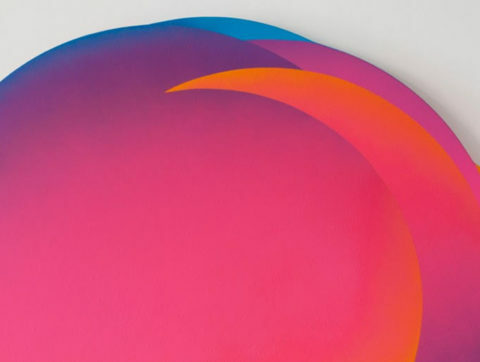 For this show, Kaláb presents new vibrant and dynamic compositions that meld the versatility of his canvas medium with the layered depth of sculpture. Incorporating studies in structure and mood, the artist delivers paintings resplendent in organic form. The Opening Reception with the Artist will take place Saturday, April 6th at 6:00pm. 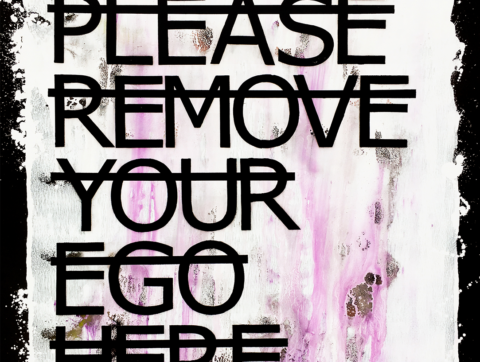 Fabien Castanier Gallery is excited to present a solo exhibition for artist collective Doma, U Owe Me 5, which will be held in our Little River gallery location from March 17 – April 13, and will coincide with the Progressive Brunch event on Sunday March 17. Power is built through a long and dark chain of favors. Welcome to the sublimation of contradiction: a phenomenology of the disaster of human evolution; the sinking world made by “Progress” and “Corruption”. In this exhibition, Doma brings an explosive skeptic cocktail, pieces from their latest body of work which began during their exhibition Naturaleza Muerta at Sala Cronopios, Centro Cultural Recoleta, Buenos Aires, that was also part of Art Basel Cities and later shown at MAR Museum in Mar del Plata. The production is characterized by a critical and biting view on reality’s absurdity. 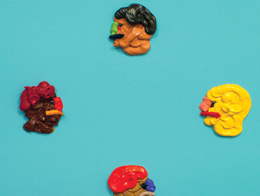 With the use of humor, their concepts focus on where contradiction and paradox reside. This presentation comprises various formats and interdisciplinary works harnessing different technologies. 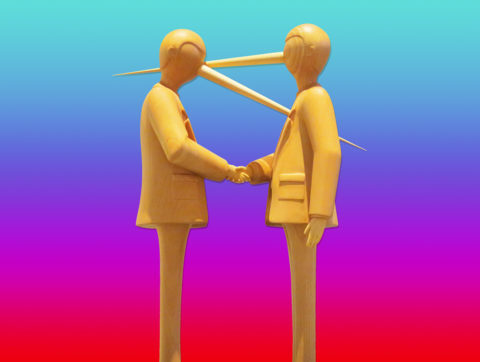 Doma collective is currently run by duo Orilo Blandini and Julián Manzelli. The opening reception will take place Sunday March 17th from 11am – 2pm, during the Little River Progressive Brunch event. Fabien Castanier Gallery is excited to present a solo exhibition for French artist Tilt, Story Telling, which will coincide with the gallery’s participation in the 2019 Art Wynwood art fair over President’s Day weekend. 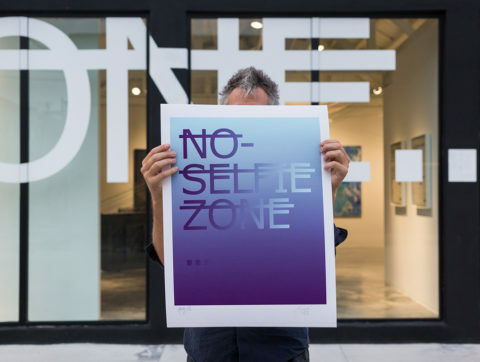 The show is held in our Wynwood gallery location from February 16 to March 3. Recognized internationally as a traditional graffiti artist, Tilt began his practice in his youth on the streets and train cars of Toulouse, France, in the 1980s. Most known for his primitive “throw-up” lettering, the artist has continued to evolve his practice while exploring the now-historical visual vocabulary of graffiti. For Story Telling, Tilt presents new work that draws a bridge with the past, incorporating deconstruction, erasure, and raw materials, all with an anti-aesthetic foundation. He continually references the lineage of graffiti art, attempting to evoke memories of this subculture’s rebellious and anarchic past. The work emphasizes the genre’s transience while simultaneously calling upon the layered and complex traditions solidified through years of artists’ practice in both the gallery and the urban sphere. Click here for more information on the exhibition. Fabien Castanier Gallery is excited to participate in this year’s Art Wynwood art fair, taking place February 14 – 18, 2019. 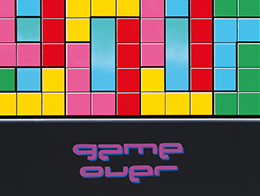 The gallery will feature work from a variety of artists, including: Speedy Graphito, JonOne, Mark Jenkins, RERO, the Miaz Brothers, Tilt, Lady M, and Jan Kalab. Since its inception in 2012, Art Wynwood has become the premier winter destination contemporary and modern art fair in South Florida, and offers the most diverse, affluent and culturally savvy international audience in the United States. Produced by Art Miami, the Art Wynwood fair will debut its eighth edition during Presidents Day Weekend, February 14 – 18, 2019, at the former Miami Herald site, which also is the new home of Art Miami and CONTEXT Art Miami, and welcomed 85,000 visitors during Miami Art Week 2018. Art Wynwood will open on Thursday, February 14, with an invitation only VIP Private Preview benefiting The New International Contemporary Arts Museum (ICA). This year and moving forward, the world-renowned Miami Yacht Show will debut alongside, and in partnership with Art Wynwood at the One Herald Plaza location. The in-water display of new and pre-owned vessels will showcase the world’s most extraordinary and uniquely designed yachts and superyachts from the world’s foremost custom boat builders. Nestled between the Venetian Causeway and MacArthur Causeway, and just east of Biscayne Boulevard, Art Wynwood will offer an unprecedented level of convenience located in the heart of the cultural epicenter of Miami. The new downtown location will also offer a renewed connectivity to the Miami Yacht Show, where the “World’s Most Expensive Yachts are on display for acquisition” just a few steps away from the fair. Speedy Graphito‘s “BEYOND THE FUTURE” show will open Sunday January 13th at our Wynwood location with a brunch reception with the artist at 11am. The exhibition, which will be on view from Jan 13 – Feb 9, represents the artist’s first step in his new evolution. Since the 1980s, the artist has changed and adapted with the times, experimenting with new mediums and styles in a way that reflected upon his personal view of the world and the changing cultural landscape. This exhibition sees Speedy explore a new frontier that evokes both a sense of nostalgia and breeds the impetus to gaze upon the future. Click here for more information on Speedy’s show. An exhibition by Colombian photographer, Gabriel Eisenband Gontovnik, entitled “COLOMIBA: Into the Wild” will open on Sunday January 20th at our Little River location. Over the past two years, Eisenband has been on a journey across his home country in order to document for the first time the mostly unknown landscapes of Colombia’s National Parks. 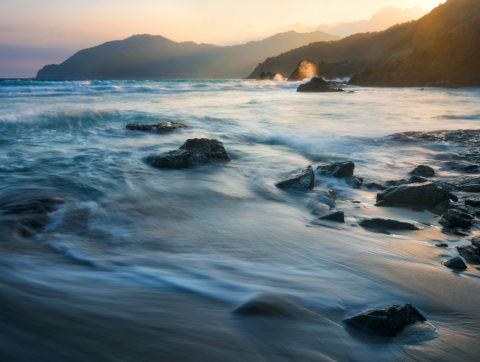 The exhibition includes the work that was commissioned for the preeminent photographic book on the country’s park system, an area that covers 14 million hectares – a total of 12% of the country’s land mass. Click here for more information on Eisenband’s show. Speedy Graphito and the Fabien Castanier Gallery present a very special time-limited edition print release for this holiday season! The giclée print, “The Addiction of Mona Lisa”, is sized 24 x 18 in. (61x46cm) and priced at $200 + free domestic shipping. * It will be signed and numbered on 300g cotton fine art paper, and with a certificate of authenticity. It will be made available for purchase for only 48 hours, Saturday Dec 22 through Sunday Dec 23. This print release will have a total number of editions based on the number of pieces sold during the 48 hour sale, guaranteeing everyone who purchases during the event gets a print. The print will be limited to this one time release, and the design will not be re-printed. Visit the Castanier Gallery Store to see the piece, from 12:00am (EST) Saturday December 22 to 11:59pm (EST) Sunday December 23. * Because edition size and thus production time is determined after the sale, please allow for 4-8 weeks for delivery. 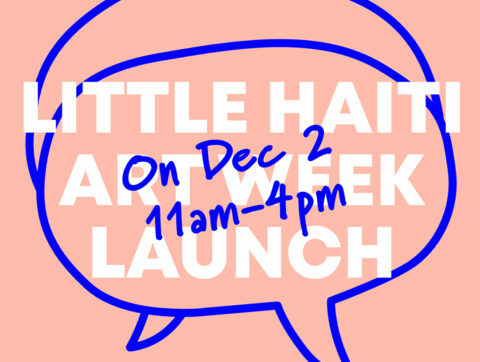 To kick-off this year’s Art Week season in Miami, 12 galleries will open together for a special Art Walk in the Little Haiti area. Join us for refreshments and the Miaz Brother‘s solo exhibition BOUNDLESS, which as traveled from our Wynwood space to our Little Haiti location. Click here for a map of all participating spaces. 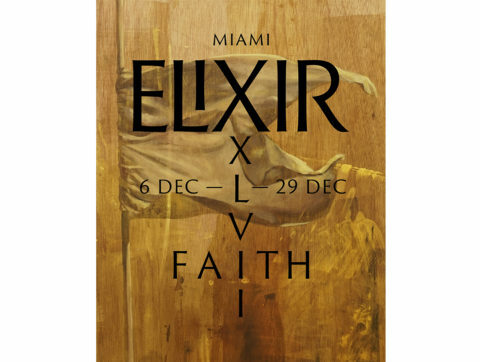 Fabien Castanier Gallery is proud to present the first solo exhibition at our gallery for artist Faith XLVII, Elixir. The show will be on view in our Wynwood space, with an opening reception with the artist coinciding with Miami’s Art Basel week. The gallery will be participating at the Art Miami art fair, presenting work by six artists including Faith XLVII. ELIXIR (from Arabic: ريسكإ†- Iksīr; from Greek xērion) – a sweetened, aromatic solution of alcohol and water used as a vehicle for medicinal substances. an alchemic preparation formerly believed to be capable of prolonging life. A substance formerly believed by alchemists to be capable of transmuting base metals into gold. Elixir is a multi-disciplinary exhibition conceived by Faith XLVII that aims to incite exploration in the viewer, both internally and externally. The body of work consists of pieces made from a broad range of media such as large-scale paintings on wood, tapestries, mosaics, silver print. 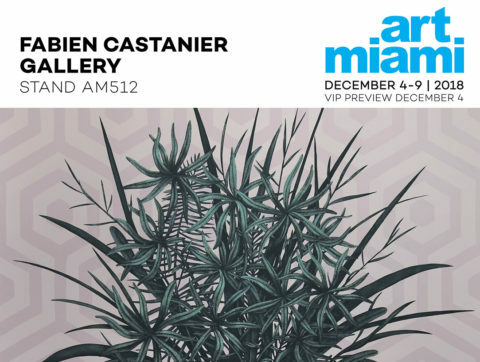 Fabien Castanier Gallery is excited to participate in this year’s Art Miami fair. We will be exhibiting work from six of our artists, including Speedy Graphito, Mark Jenkins, JonOne, RERO, Faith XLVII, and the Miaz Brothers. Recognized as one of the preeminent international modern and contemporary art fairs, Art Miami will showcase an array of iconic and important art works, dynamic projects and special installations from more than 160 international galleries from nearly 30 countries representing 68 cities. This year’s fair will kick off with a Platinum VIP Preview for top collectors, curators, and members of the press on Tuesday December 4, from 4:30PM – 5:30PM to benefit the Pérez Art Museum Miami (PAMM)​, sponsored by Christie’s International Real Estate​. The VIP Preview will open for all VIP Cardholders at 5:30PM and continue until 10PM. This is the eighth consecutive year that PAMM has been the fair’s exclusive VIP Preview benefactor and Art Miami has already donated more than $150,000 to further the museum’s collection and mission. The partnership remains an integral part of Art Miami’s larger commitment to the city of Miami. The gallery has complimentary passes, please contact us for more information. 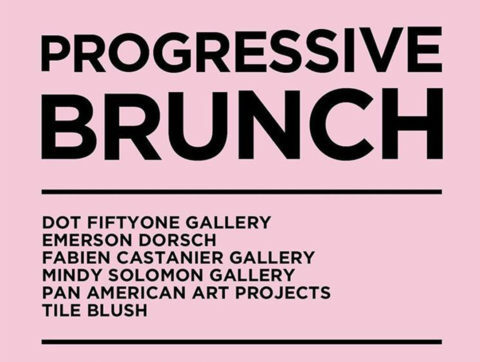 Fabien Castanier Gallery invites you to the Progressive Brunch at our new gallery location in Little River, located at 6629 NE 2nd Avenue. Join us for our first group exhibition, “TIME IS NOW,” which will feature work from a variety of artists, including: Speedy Graphito, JonOne, RERO, Mark Jenkins, Miaz Brothers, TILT, Jan Kaláb, Faith XLVII, Adam Beris, Doma, Aaron De La Cruz, Andrew Schoultz, Luke Newton, OX, and Stuart Semple. 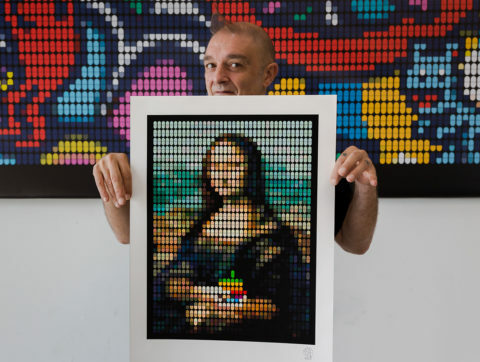 Since founding his first art gallery in Paris and Corsica in 1998, for 20 years Fabien Castanier has continued to foster an international and cutting edge approach to his gallery program. From France, to Los Angeles, Bogotá, and now Miami, he brings to the burgeoning art community in Little River a collection of artwork at the forefront of the contemporary landscape. This new space is the second location for the Fabien Castanier Gallery in Miami, and while the first location which is located in Wynwood will house an on-going exhibition program, our Little River space will continue to present unique projects and alternative experiences. “TIME IS NOW” will be a comprehensive preview into the future of our new location and the exciting evolution of this up-and-coming area. Fabien Castanier Gallery is proud to present BOUNDLESS, solo exhibition for Italian artist duo the Miaz Brothers, open from November 3 to 24, 2018. This is the third solo exhibition for the Miaz Brothers at the gallery and their first in Miami, featuring a new series of paintings. 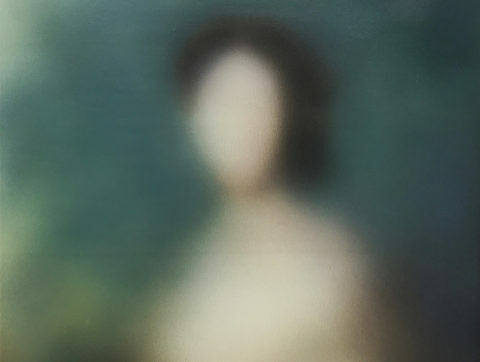 For BOUNDLESS, the Miaz Brothers present a series of ethereal portraits focusing on female figures. Rendered with layers of aerosol paint, the artists explore the space between one’s perception of the self and that which is intangible. Their paintings are not representations, but are rather studies in perception, as the viewer’s interaction with the work is the foundation of their concept. The artists encourage the observer “to interact with the image and to [filter] it through the process of identification – to achieve something not fixed and limited but boundless and personal”. The Opening Reception will take place Saturday November 3rd at 7:00pm. The giclée print, sized 24 x 18 in. (61x46cm), will be signed and numbered on 300g cotton fine art paper, and with a certificate of authenticity attached. It will be made available for purchase for only 48 hours, Saturday Oct 20 through Sunday Oct 21. Visit the Castanier Gallery Store to see the piece, from 12:00am (EST) Saturday October 20 to 11:59pm (EST) Sunday October 21. * Because edition size and thus production time is determined after the sale, please allow for 6-8 weeks for delivery. Join Speedy Graphito at the Cornell Art Museum this October for the opening of the group exhibition, Tech Effect. The exhibition, which will be on view through Feb 2019, explores the way technology has influenced contemporary art. See augmented reality works, interactive touch screen works, the prevalence of social media in contemporary art, artwork that utilizes code, and countless ways that technology is integrated into contemporary art. For the show, Speedy Graphito will present a number of his pieces, mixed media and sculpture, as well as a special immersive installation. This large-scale piece will incorporate interactive and technological aspects, themes that the artist has explored in his recent work. Additionally, Speedy will paint the facade of the Cornell Art Museum, a first for the Delray Beach institution. He will begin his mural a week before the exhibition opening and his process will be on view for the public during that time. The show will feature work from: Henry Ballate, Walter Brown, Miguel Chevalier, Ellen de Meijer, Brian Dettmer, Daniel Fiorda, Antione Geiger, Speedy Graphito, Camomile Hixon, Allison Kotzig, Matthew LaPenta, Alain LeBoucher, Taekyeom Lee, John Messinger, William Montgomery, Pia Myrvold, Elizabeth Phelps, Jonathan Rosen, Constance Scopelitis, and Sara Zaher. Located in the epicenter of Delray Beach on bustling Atlantic Avenue at Old School Square, the Cornell Art Museum strives to show internationally recognized contemporary artists who create innovative and provocative works of art. The museum recently underwent a dramatic renovation, transforming their hundred year old building into a state of the art facility to showcase contemporary art. Fabien Castanier Gallery is proud to present a solo exhibition for French artist RERO at our Miami Art Wynwood gallery. The exhibition, entitled SONGS WITHOUT WORDS…, is the third solo exhibition for RERO at the gallery and his first in Miami, featuring all new mixed media works and installations. Join the artist for the opening reception on Saturday, October 6th @ 7:00pm. SONGS WITHOUT WORDS… presents the artist’s internal conflict concerning the use of words as expression and how the boundaries between different arts are porous. He explores moments when writing invites itself into painting, painting invites itself into music, and music invites itself into plastic art. 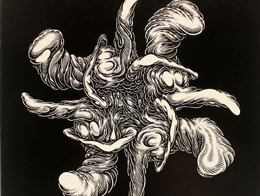 RERO’s work has always focused on these bridges, as he combines a multitude of mediums and techniques in his practice. For the artist, he believes that creatively one no longer belongs to a single ideology or concept – that the boundaries between styles and forms are fluid, as are the connections between music and spoken word. This exhibition sees RERO positing that “music” is found in all things, whether verbal, literal, or physical, sounds and rhythms abound in every form of artistic expression. 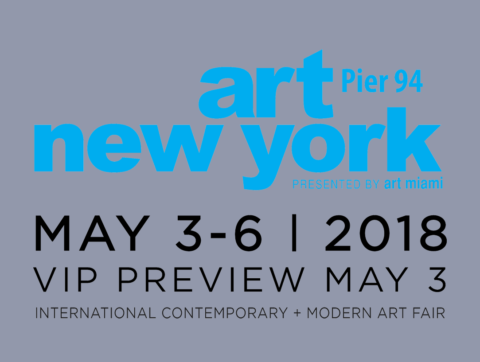 Fabien Castanier Gallery is proud to participate in this year’s Art New York art fair, taking place May 3-6. 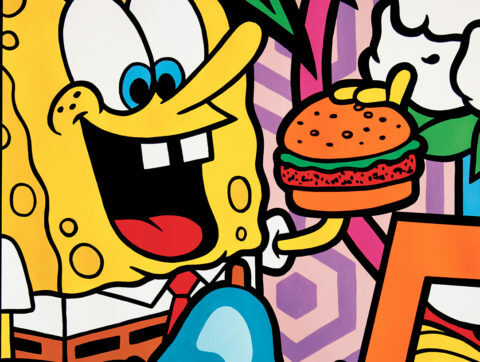 The gallery will exhibit work from artists Speedy Graphito, Mark Jenkins, JonOne, and the Miaz Brothers. The gallery has complimentary tickets, please contact us for more information. The Fabien Castanier Gallery presents a group exhibition, “Untitled”, in Los Angeles, featuring a selection of work from our artists. The show will include Speedy Graphito, Alex Kizu, Miaz Brothers, Mark Dean Veca, JonOne, Mambo, Aaron De La Cruz, Adam Beris, Diana Thorneycroft, and Mark Jenkins. “Untitled” incorporates work on canvas, photography, and sculpture. Fabien Castanier Gallery is excited to exhibit in this year’s Art Wynwood art fair, taking place February 15-19, 2018, over President’s Day weekend. The gallery will exhibit work from artists JonOne, Speedy Graphito, the Miaz Brothers, RERO, Mark Jenkins, and Fidia Falaschetti. Click here for more information on the fair. During President’s Day weekend, the gallery in Miami will also open our next solo exhibition, Wanderlust with new work from JonOne. The opening reception with the artist will take place Saturday, February 17th from 7-10pm. 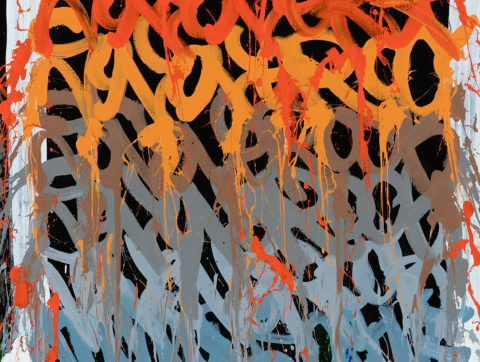 This is the fourth solo exhibition for JonOne with the gallery and his first in Miami, featuring all new works on canvas by the internationally acclaimed urban contemporary artist. JonOne (b. 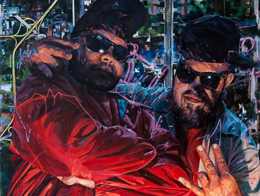 1963, New York) is one of the most influential urban artists of his generation. He grew up in Harlem, New York, where he discovered the thrill and personal expression found through painting in the streets and on train cars. 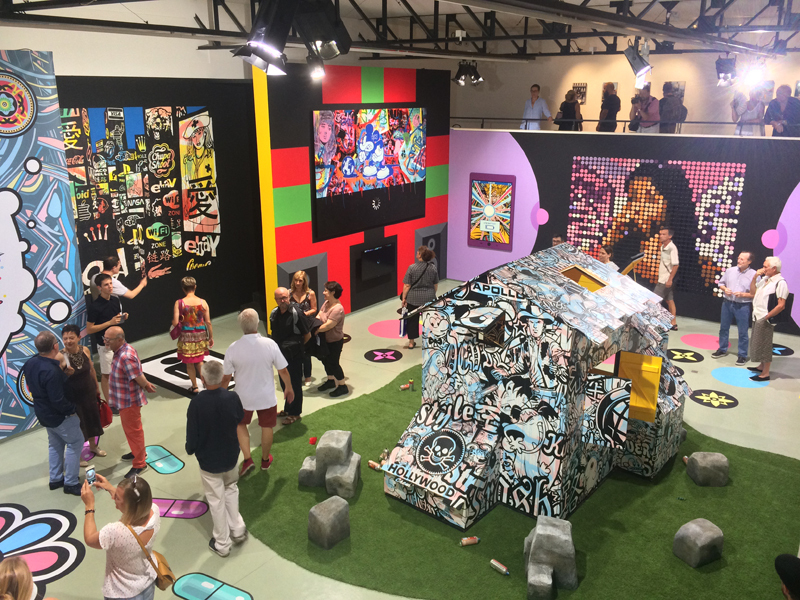 A critical moment in the history of graffiti occurred during this time in the 1980s, and JonOne chose to transport his New York graffiti roots to the streets of Paris when he was only 20 years old. Establishing his life in France, he has since grown his career and reputation for the past 30 years with a unique style, unparalleled in his genre. Click here for more information on the Wanderlust exhibition. Speedy’s artistic universe has always been built on an honest dialogue concerning the role of the image within modern society. Since the inception of his career in the 1980s, his work has dealt with concepts of commercialism, iconography, and pop culture. The ever changing nature of his subject matter, with new motifs and icons that evolve and emerge over time, has allowed him to take his art into myriad directions. He traverses all mediums, from painting to film and photography, sculpture and installation. Speedy has influenced a generation of artists and continues to pioneer the use of pictorial languages and the satirical appropriation of characters in contemporary art. Speedy’s first solo exhibition in the U.S. was held at the Fabien Castanier Gallery in the fall of 2011, and the gallery has since remained the artist’s exclusive representation in North America. Since then, the gallery has held three more solo shows as well as featured Speedy’s work at preeminent art fairs. With a growing audience in the U.S., Speedy has also developed new and important ventures in his native France. Most recently, the artist’s work has been inducted into his first museum, Le Musée du Touquet-Paris-Plage, with a retrospective exhibition entitled “Un Art De Vivre” that took place from October 2016 – May 2017. Last year he also had a solo show, “Big Buzz”, held at the renowned l’Espace d’Art Contemporain André Malraux in Colmar, as well as “A World of Dreams” solo exhibition at Galerie Polaris in Paris. ABOVE: Speedy Graphito’s “Big Buzz” exhibition in 2017. 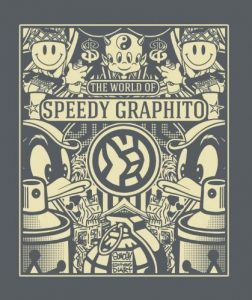 *The Fabien Castanier Gallery is selling copies of Speedy’s new book, “The World of Speedy Graphito”. Contact us to get your copy. 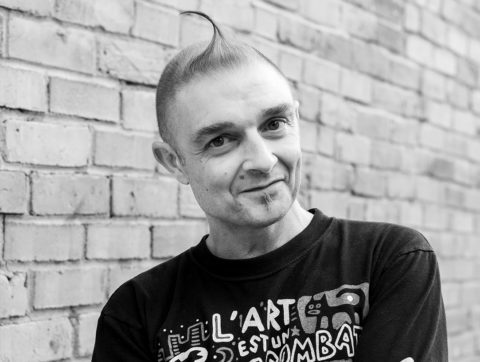 “The World of Speedy Graphito” will be released in both French and English, with text by Florent Hugoniot, Stéphanie Pioda, Gérard Lemarié and Speedy Graphito. This 256 page monograph highlights the artist’s most notable work and evolution of style from the 1980s up until today. 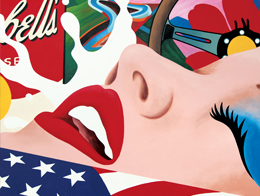 Fabien Castanier Gallery is very excited to present POPADELIC, group exhibition featuring new work from artists Speedy Graphito, Ron English, and Fidia Falaschetti. The exhibition will coincide with Miami’s Art Basel week, where the gallery will be participating at the 28th edition of the Art Miami fair. The exhibition will open December 7th with an opening reception from 7-11pm. At this year’s edition of the Art Miami art fair, the gallery will exhibit work from a variety of artists, including, Speedy Graphito, JonOne, the Miaz Brothers, Andrew Schoultz, Fidia Falaschetti, and Mark Jenkins. In its 28th edition, Art Miami maintains a preeminent position in America’s modern and contemporary art fair market and is globally recognized as a primary destination for the acquisition of the most important works from the 20th and 21st centuries. For more information visit www.artmiami.com. The gallery has complimentary passes to the fair, please contact us for info. 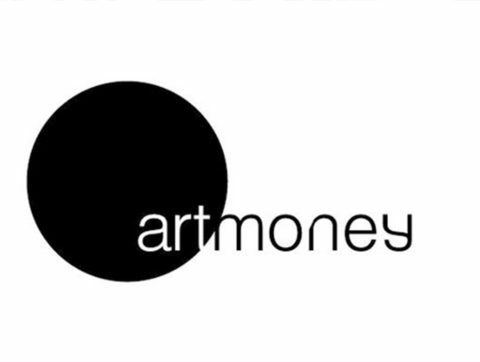 Fabien Castanier Gallery is excited to announce that we are now offering Art Money: a new way to buy art. Art money makes owning art easier and more affordable, Payments are spread over 10 monthly installments, with no interest or fees. Clients can apply online for instant approval, take art home immediately and pay for it later! Visit www.artmoney.com for more information or contact the gallery for details. Fabien Castanier Gallery is excited to announce our next solo exhibition in Los Angeles, Soft Bananas, featuring new work from LA-based artist Adam Beris. 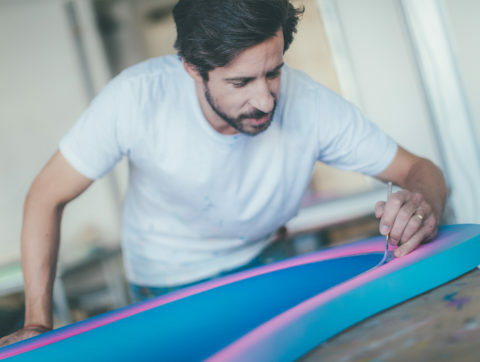 For his first solo show in Los Angeles, Beris will present paintings that are sculptural in nature, using his technique of applying pigment directly from tube to surface to examine a variety of contemporary themes. The Opening Reception with the Artist will take place Saturday, November 4th at 6-9pm. Due to Hurricane Irma, our Miami gallery has postponed the opening reception of our next group exhibition in Wynwood, “Ciudad Mágica”. The opening event has now been scheduled for Saturday, September 30th from 6-9pm, and the gallery will be closed to the public until then. 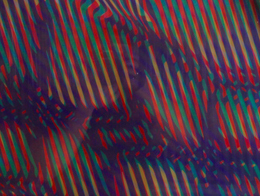 “Ciudad Mágica” features new work from artists Hoxxoh, Andrew Antonaccio, and Michael Vasquez. Fabien Castanier Gallery is excited to announce our new fall group exhibition in Los Angeles, Mark Making with work by Aaron De La Cruz, Alex Kizu (aka Defer), and Mark Dean Veca. Each of these artists present work that is built on a foundation of mark-making. 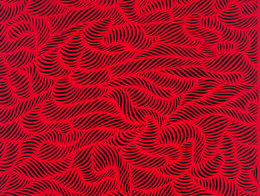 Recalling a variety of styles, including abstraction, design and graffiti, the artists are most familiar with creating large scale installations, pieces that envelope the viewer in realms of meticulously detailed line-work and hypnotizing compositions. The exhibition will include paintings, sculpture and installation. The Opening Reception will take place Saturday, September 16th from 6-9pm, and the exhibition will be on view through October 14, 2017. Fabien Castanier Gallery is excited to announce our upcoming exhibition in Miami. Opening Thursday, September 7th, at the Miami Wynwood gallery will be our group exhibition Ciudad Mágica, featuring three Miami-based artists: Hoxxoh, Andrew Antonaccio, and Michael Vasquez. While each artist conveys vastly different styles, they are all based in Miami, creating works inspired by the city’s rich cultural history and dynamic aesthetic. Miami is often referred to as the Ciudad Mágica (the magic city), a nickname born out of the city’s rapid growth. With its burgeoning transformation every year, the Miami art scene continues to evolve and this exhibition presents a focus on three particularly prolific image makers. Click here, to read more about Ciudad Mágica. 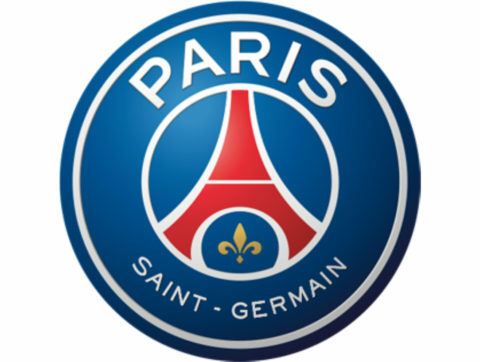 The Fabien Castanier Gallery is excited to announce a special 9-day silent auction event at our Miami Wynwood gallery, organized in collaboration with the Paris Saint-Germain soccer club’s preseason tour in Miami! The auction will kick-off with a cocktail reception, Thursday July 20th @6-10pm, with a number of the PSG club players in attendance. The silent auction will run from July 20 – 29, and will benefit the Paris Saint-Germain Fonds de dotation, the club’s charity organization dedicated to a variety of causes, such as programs that support under-privileged youth and children in need, providing education and betterment through sports.The gallery cocktail event will coincide with the Paris Saint-Germain Residence pop-up store launch party, a high-end venue that will sell exclusive PSG merchandise. The pop-up store is located only a few blocks from the Fabien Castanier Gallery, at 20 NE 27th Street, Miami, FL 33137. The launch will take place July 20th at 8pm. For the silent auction, the gallery has organized the creation of new and unique artworks from a variety of international contemporary artists, and a significant portion of the proceeds from the silent auction will go directly to the club’s charities. The artists will present paintings that incorporate the spirit of the event, with motifs on soccer and the city of Miami. In addition, the club has donated jerseys and soccer balls that a selection of artists will use as their canvases, creating one of a kind works of art. For years the Fabien Castanier Gallery has supported the idea of art as a way to bring communities and nations together by cultivating an international artist program, and with the silent auction the gallery can continue to support this cross cultural exchange. There will be a catalog of work for the silent auction. Please contact the gallery for more information. Fabien Castanier Gallery is excited to participate in the first New York edition of the Urban Art Fair, taking place June 29 – July 3, 2017. The gallery will showcase work from Speedy Graphito (FR), Andrew Schoultz (US), Mark Jenkins (US), Zez (US), JonOne (US/FR), and RERO (FR). Started in Paris, France in 2016, the Urban Art Fair is an international showcase of the world’s leading urban and contemporary art, featuring new work from today’s image-makers as well as historic pieces from the genre’s inception. The fair will present 24 international galleries as well as special exhibitions and projects.